1978 Chevrolet C10 Presenting a Raven Black C10 with 65,000 miles that issure to turn heads. Turn key, mostly original condition. Loaded with manyfeatures including: air-conditioning, AM/FM radio, tilt wheel, cruise control,power steering, power breaks and 20 inch Boss wheels and tires. Hard to find anythingwrong inside and out. 350 V8 engine with an automatic transmission. Drives as greatas it looks!!!! You will not be disappointed with this truck! Jensen Dealerships is proud to serve the Siouxland area with quality Subaru, Mazda, Volkswagen, Dodge, Ram, Ford and Chrysler vehicles. With models like the Chrysler 200, Chrysler 300C,Avenger, Challenger, Dart, Durango, Grand Caravan, Journey, C-Max, Edge, Escape, Expedition, Explorer, F-250, Fiesta, Flex, Focus, Fusion, Mustang, Taurus, F-150, Ram 1500, Town & Country, Compass, Grand Cherokee, Patriot, Wrangler, Cx-5, Cx-9, Mx-5, Mazda 3, Mazda 5, Mazda 6, Forester, Legacy, or XV Crosstrek , we have something for every taste and need. Come visit us at 3909 Stadium Drive in Sioux City or 1258 Lincoln St SW in Le Mars to see our vehicles and take one for a test drive. If you're looking for a used car near Vermillion, Sioux City or Le Mars, we can assist you there as well. Visit our inventory page to see our large collection of pre-owned vehicles. 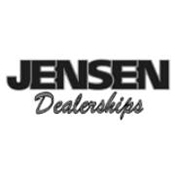 Jensen Dealerships is not just your Sioux City & Le Mars Subaru, Mazda, Volkswagen, Jeep, Dodge, Ford and Chrysler dealership, we also provide a full line of services dedicated to our tri-state customers. From car repairs performed by expert mechanics, to OEM Dodge, Ford, Chrysler, Ram, Jeep, Volkswagen, Mazda and Subaru auto parts, to car loans in Sioux City , Jensen Dealerships is the smart choice for your automotive needs. We are the premier provider of car parts in Sioux City and Le mars, so stop by our auto parts center today. We are proud to serve Sioux City IA, South Sioux City NE, Orange City IA, Moville IA, Wayne NE, Sioux Falls SD, Vermillion SD and Omaha NE.